Following the emergence of the Jaff ransomware attack campaign earlier this week, another, even bigger outbreak is making headlines. The culprit? A new ransomware family called WannaCry or WCry. Spotted earlier today, WCry caught the attention of the team due to it being spread via the recently exposed NSA shadow broker exploits. WCry took many businesses and public institutions by surprise, including telco giant Telefonica in Spain and the National Health Service in the United Kingdom, and has already infected tens of thousands of systems across the globe. Security researcher MalwareTech created a map of overall infections and a real time map of infections to visualise the number of WCry infections, which has surpassed the 350,000 infection mark across more than 100 countries worldwide. The WCry ransomware, also referred to as WNCry, WannaCry, WanaCrypt0r or Wana Decrypt0r, was originally spotted in campaigns in early February 2017, with more campaigns following in March. But it wasn’t until now that a global attack had been registered. It has been written in C++ and no attempts have been made to hide the majority of the code. Like most ransomware families, WCry renames files it encrypts, adding the .WNCRY extension. 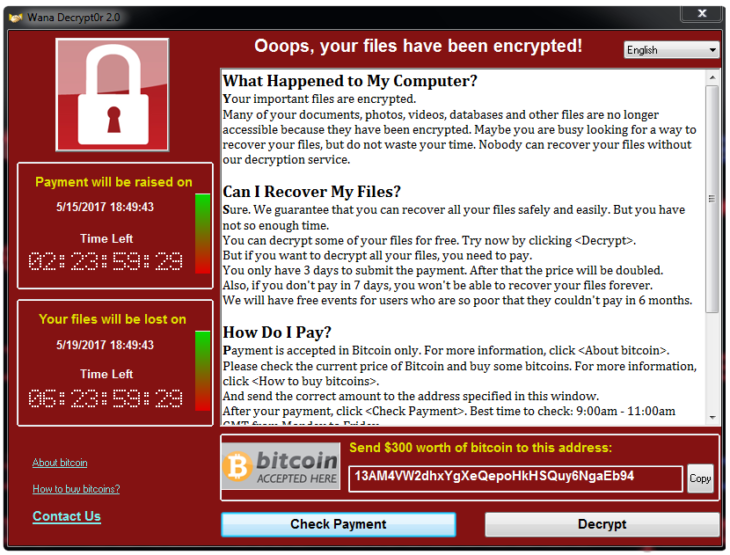 How do you get infected with WCry ransomware? At the moment, WCry is primarily spreading via the leaked NSA exploits that the Shadow Brokers group released recently. More specifically, French researcher Kaffine was the first to suspect that WCry was being spread via the ETERNALBLUE exploit. In addition, it appears that the malware authors are also taking advantage of DOUBLESPEAR, a backdoor that is usually installed via the ETERNALBLUE exploit and persisting on the system. So if your system was compromised by ETERNALBLUE previously, chances are your system is still vulnerable, even if the initial SMBv1 vulnerability was patched. c.wnry – Configuration file containing C2 server addresses, BitCoin Wallet etc. t.wnry – The encryption part of the ransomware encrypted using a WanaCry specific format; can be decrypted using the private key embedded inside the ransomware executable. 00000000.eky – Encryption key for the t.wnry file which stores the actual file encryption component used by the ransomware. It is encrypted using the public key that belongs to a private key embedded inside the ransomware. A list of all changes made by the ransomware to an infected system, can be found in the “Indicators of Compromise” section below. WCry ransomware uses a combination of RSA and AES-128-CBC to encrypt the victim’s data. To facilitate this process, is uses the Windows CryptoAPI for RSA, but a custom implementation for the AES encryption. Interestingly, the encryption routine is stored in a separate component within the t.wnry file, and is itself encrypted using the same method used by the ransomware to encrypt user files. 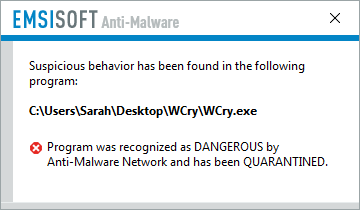 This was likely done to make the malware analysis more difficult. The module is loaded into memory using a custom loader and executed from there, without ever being written to the victim’s disk unencrypted. When WCry arrives on a system, it will first import a hardcoded private RSA key that is used to decrypt the file encryption component stored within “t.wnry”. Once done, the ransomware will generate a new private RSA key. That RSA key is then submitted to the malware’s command and control server and a copy of the generated public key is stored on the system. Once done, the malware will generate a new 128 bit AES key for every file it found, which is encrypted using the public RSA key generated earlier and the RSA-encrypted AES key is stored within the header of the encrypted file, together with the file marker “WANACRY!”. The AES key is then used to encrypt the file’s content. Unfortunately, after evaluating the way WCry performs its encryption, there is no way to restore encrypted files without access to the private key generated by the ransomware. So it’s not likely a free WCry ransomware decrypter will be available for victims. How can I protect myself from WannaCry? As an emergency measure, make sure to have the latest security updates installed on your Windows computers and servers. Given the scale of the attack, Microsoft even took the unusual step to release security patches for “unsupported systems” such as Windows XP and Windows Server 2003. As explained in our ransomware article, the best protection still remains a reliable and proven backup strategy, especially since the encryption used by WCry ransomware is secure. The only way to get the data back is through the help of the ransomware author or via restoring from backups. Making sure to install critical windows updates is also a very important step in protecting a system, as WCry only seems to be spreading via the SMBv1 exploit currently, which has been patched for 2 months already. Apart from regular backups, you will be glad to hear that the Behavior Blocker technology used by Emsisoft Anti-Malware and Emsisoft Internet Security has proven to be the next best defense, as it has caught the ransomware before the file could execute and thus once again keeping our users protected from this and hundreds of other ransomware families without the need for signatures. Contact SWC for your Emsisoft products. We consider ransomware one of the biggest threats of the past year and plan to do our best to continue our excellent track record in the next year, to keep our users as protected as possible. It seems to be an impossible puzzle yet it’s easy to solve the Rubik’ Cube using algorithms.